Eleven-year-old James Clyde has no memories of his parents. As far as he knows, his grandfather, Wilmore, is his only living relative. James and his friends, Mary and Ben Forester, are off to spend their Christmas vacation at Wilmore’s mansion in the country when a shadowy figure from Wilmore’s past comes after him and poses a threat to James, too. The three children flee to the mystical land of Orchestra, which has been waiting all these years for the return of its hero, James, to save his people and to keep Orchestra’s three precious diamonds from falling into the wrong hands. At first glance, James Clyde and the Diamonds of Orchestra has all the right ingredients for a middle grade fantasy: knights, magical creatures, an evil queen, and an eleven-year-old boy prophesied to rescue the kingdom. James and his friends, siblings Ben and Mary, have a series of exciting adventures that are sure to thrill younger readers. For me, though, the book was missing that sense of whimsy that pulls you into a fantasy world and makes you feel like you’re a part of it as opposed to just reading about it and following along. I couldn’t quite find that connection to the book or the characters here. One of the obstacles I encountered when trying to immerse myself in the story was how identical the characters’ voices sounded to me. Whether it was an adult or a child who was speaking, the dialogue didn’t provide much insight into their personalities. On the whole, I didn’t get much of an idea of who these characters were, other than some were clearly good and some were clearly evil. It was hard taking a particular interest in most of them because I felt as though I’d barely gotten to know them. The exception was Kila, one of the knights on the side of good. He embodies chivalry with his bravery, dedication to his duty, and, of course, his masterful skill with a sword. I’ve always loved tales of knights saving the day, and my favorite part of the book was reading about the exploits of Kila and his brothers-in-arms. I also thought that exposition could have used some more detail. 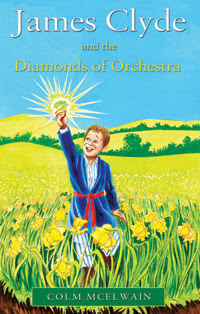 There are references to stories about the land of Orchestra and its magical diamonds that Wilmore, James’s grandfather, has apparently told the three children. I would have liked to have heard one of these stories myself to gain a deeper understanding of the lore, but you have to wait until the trio actually journeys to Orchestra to learn more about Orchestra. As I read the book, I had the overall impression that the characters were in on information of which only bits and pieces were shared with the reader. Several later chapters are devoted to recounting how James ended up an orphan, and they filled in a lot of the blanks, but I wouldn’t have minded learning a few of these things a little earlier. Younger readers will probably take to the quest aspect of the novel, but I needed some additional backstory and depth to the characters for this to be a page turner. I did enjoy reading about anything that had to do with the knights of Zara, and the action sequences were pretty intense. I just wish I’d connected better with James and his friends. I think some fine tuning of the character development and the dialogue were what would have made this a solid read for me. I liked its quest-driven premise, and I’m always happy to see knights make an appearance in a fantasy novel. Knights are great, and I love a good quest. To be honest though, even in middle grade books, character development is really where it is. I think I would have struggled with you too if there were not much identifying voices between the characters. Excellent review! Jaclyn @ JC's Book Haven. I just didn't have that investment in them where everything they experience, you feel like you're experiencing, too. When this kind of thing happens, it reminds me how subjective reading can be; I'm sure someone else would pick up the book and have the completely opposite opinion.